Blog: Spine 3.7.00-beta released - Audio! Hot on the heels of our recent 3.6 release, we're happy to announce the release of Spine 3.7.00-beta. This release focuses on audio directly within the editor, to make synchronizing animations to your audio clips easier. The first difference you'll notice in this beta release is the addition of an audio node in the hierarchy view. The new audio node works similarly to the images node. 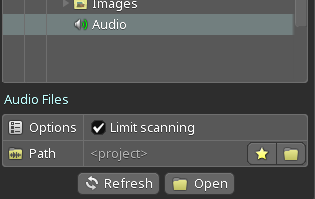 All audio files found in the specified path will be listed under the audio node (which is only available in setup mode). Spine currently supports the WAV, MP3, and OGG audio formats. Once you've placed an audio file in the (sub-)folder the audio node's path points to, it will show up under the audio node. Selecting the audio file will allow you to create a new event from the audio file. You can also drag an audio file onto an existing event. 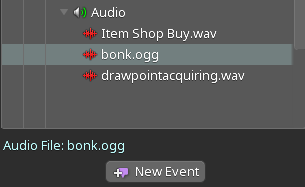 Events now have an additional field called "Audio path", indicating which audio file they are associated with. When you key an event with an audio path set, the dopesheet will show the length of the audio file and, in future betas, the audio waveform. When you playback the animation, the audio will start playing as soon as the event key is triggered. Note that the duration indicator for the audio file appears in the timeline only once the audio file has been loaded. We'll expand on the audio feature in future 3.7-beta releases. The next step is to also display waveforms for each audio file in the timeline, which will help with lining up your audio and animations. The audio feature is currently editor-only. At runtime, audio is handled as before: register an event handler with AnimationState, react to events and playback the audio you want for a specific event based on the event's data: its name, string, int, float, or audio path fields. For discussion, feedback, and bug reports, please post on the forum thread for this release!